Basecamp Classic: Can I save and reuse to-do lists? To-Do List Templates allow you to save time and typing by creating frequently used to-do lists which you can then add easily to any project. To-Do List Templates are global which means they are available to you from within any project. From the Dashboard click the Templates tab on the right side of the screen. Then click on the link that says To-Do Templates. Then click on the link that says Create your first to-do template. Create to-do list templates just like normal to-do lists. Any lists you make here will appear in a pulldown when you create lists inside your projects. Then you can just choose a template and it will load in — saving you time and typing. Next, go into a project and click the To-Do tab. Then, click the New to-do list link. 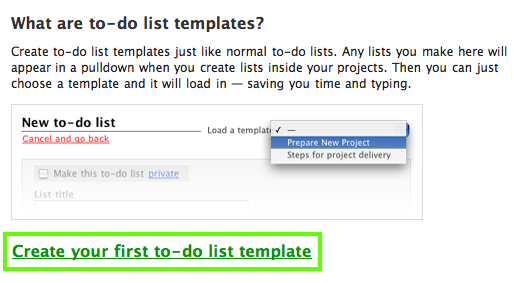 To use a template, click the Use a to-do list template link (Note: you’ll only see this link if you’ve created a to-do list template). Select the to-do list template from the pulldown that appears. Once you hit the Create this list button, the to-do list page will reload and the selected template will now be loaded in your new to-do list screen. You can then adjust the list title or items and assign responsibility for the items. Note: Clients and contractors can’t create templates, only people who are Administrators in your own company’s account can.